What is your favorite area in your home and why? What an exciting series, I'm so happy to be a part of it! My name is Brooke and I would like to introduce to you my chosen space. Here is my kitchen, a space I truly LOVE. Our kitchen did not always look like this (I will include a before picture for you to see the difference). 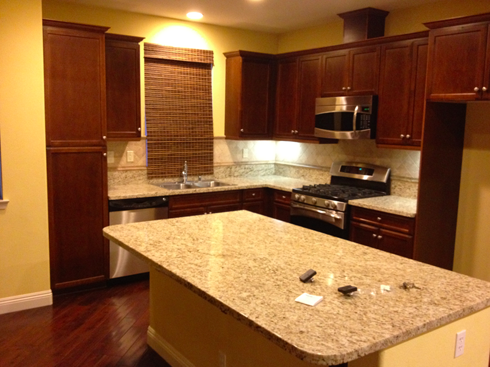 When we purchased our town home, I had mixed feelings - I was so excited to be a first-time home owner, but the kitchen was just so far from my dream kitchen (dark cabinets, dark granite...just overall DARK! 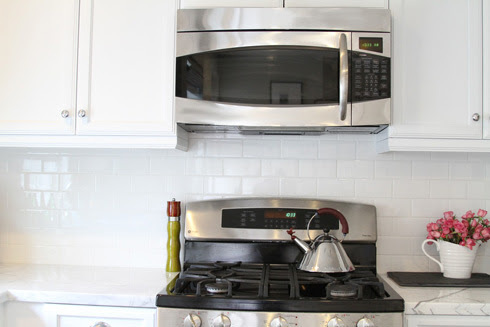 ), and I had always dreamed of a bright, white kitchen. We decided to re-do the kitchen, but we were working with a tight budget, so having to be very resourceful was a challenge, but a lot of fun at the same time. We replaced the counters, cabinet hardware, and backsplash, painted the cabinets white, and had roman shades made to replace the existing (you guessed it, DARK) bamboo shades. The transformation is something I am very proud of, and I am so happy we decided to go through with it. I cook for my family (husband and baby girl) 5 nights a week, so having a space that I enjoy is essential, and I am so thankful for that. I hope you enjoy the transformation! I love your new space! I've always felt the same way about a dark kitchen. The kitchen in my childhood home looks a lot like your before picture and I've always dreamed of having a white one in my permanent, grown up home! The re-design looks great... Definitely a lot lighter! It looks awesome! Its amazing how much just paint changes a space! 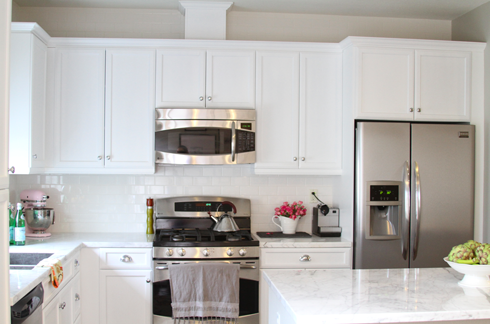 A white kitchen is my dream, so light and bright! Wow! What a gorgeous transformation! 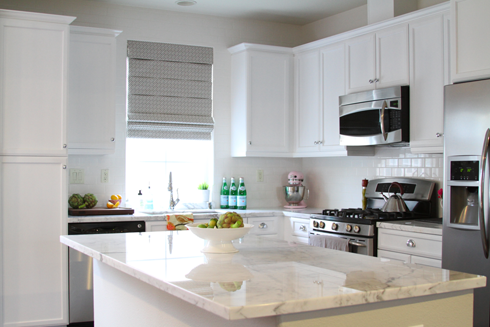 I love bright white kitchens as well. Wow! I know one photo was taken at night and the other one - with bright day light, but still - what a transformation! That's why I love white interiors - makes the rooms look so much bigger and brighter! Your kitchen looks great. What a transformation. Happy to see you didn;t rip it all out, but made use of what you had. I also love the counters. I did Carrera in my kitchen and although I love it, I am shocked by all the rings on it from the etching. Is yours etching too....it looks perfect in the photos. I love your kitchen before the makeover! I love it even more with all of the white! It looks so clean and modern! Definitely looks like a dream kitchen! Amazing makeover!I love bright kitchens!I'm also at the process of painting my old cabinets from a bark brown to a very bright pastel olive colour! Love this re-do so much!!! Love this light, bright, airy kitchen. I am not certain but this kitchen looks alot like my old townhouse kitchen in SM. One of the reasons for my purchasing it was because of the kitchen. I did not see it as dark I described it as warm. 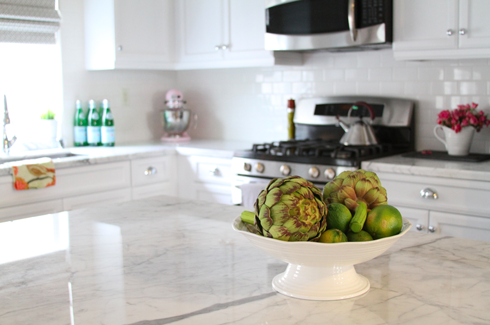 I must say the white is nice...love the marble counters. GET A FREE BRACELET ! !